Insulated, Damp Proof Course, Deeds & More! 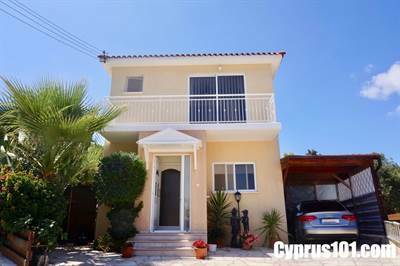 This well maintained three bedroom detached home is located in a quiet and peaceful residential setting of Stroumbi, a popular village 15 to 20 minutes’ drive from Paphos. All bedrooms feature stylish white fitted wardrobes and are fitted with ceiling fans. Bedroom three also benefits from direct access to a private balcony which overlooks the garden and pool – another perfect spot to enjoy the tranquil rural setting.